Note: Consult the 2014 version of our do-not-call list. New renters in Chicago are often confused or misled by Craigslist ads into believing that they’re contacting a landlord or management company when they respond to an ad by one of the apartment locators we call bedbugs due to their many noxious qualities. Many bedbug-placed ads on Craigslist are for non-existent apartments or apartments only available at a higher price. When an ad does represent an actual apartment at the advertised price, it’s likely to be advertised by dozens of bedbugs, none of whom have any control over the property or knowledge of whether it’s still available for rent. The bedbugs advertise their service as “free,” and that’s an appealing argument to renters naive enough to believe that they’re not ultimately paying the one month’s rent a bedbug receives as a commission. Finding a good apartment in Chicago is relatively easy – unless you’re using a bedbug / locator service to find one. In that case, you’ll often be shown the difficult-to-rent dogs that landlords can’t rent on their own. As a bonus, you’ll be pressured into believing that these leftovers are the best available. If you’re looking to rent in downtown Chicago or Lincoln Park, YoChicago’s Guides make it easy to see what’s available from all the major buildings and management companies. Searching the MLS at a reputable broker site and walking around your preferred area on the lookout for rental signs will expose you to almost everything else. New bedbugs are constantly being spawned, so we’ve doubtless missed some. Add a comment to help us update the list. Apartment rental services are free. When renting an apartment, one generally pays the first month’s rent and a security deposit, if the landlord/building requires it. The only difference in the case of an apartment finding service is that the first month’s rent goes to the service, as opposed to the landlord. I agree that some apartment finding companies are no good, but you are misrepresenting the facts in your article. You haven’t cited any fact I’ve misrepresented. So, the renter’s first month’s rent goes directly to the rental service to pay for the “free” service. The tenant is paying for it – either in the form of higher rent or reduced service. No way around that fact. You ought to have disclosed that you’re an agent with Rent Smart. Well, Jessica, your site also has some problems, which is why I deleted your brokerage name from the end of your post. You’ll be happy to know that I’ve alerted MRED to the fact that your site uses a phrase in its menu that MRED considers deceptive and explicitly prohibits your site from using: “MLS search.” I’m confident you’ll be hearing from their compliance staff. When you claim to play by the rules, you better do so. Thanks for the feedback on our website Joe! We do our best to operate from a position of integrity and follow the rules that MRED, CAR, and NAR specify. We are planning to update the search tab on our website within the next 48 hrs. Keep up the good work. I have deleted the link to your website from your name. I don’t believe you’re with a company that our visitors should get to know. We’ve reached the limit on threading of comment replies, so I’m linking to the start of this discussion. SECTION 6: SERVICE FEES – The Participant shall be assessed a monthly Service fee for each non-principal broker, sales licensee, licensed and certified appraiser and any other classification of real estate license that is affiliated with said Participant. The only exception will be when a special waiver of Service fee is granted by your REALTOR® Association/Board of Directors and approved by MRED. The issue isn’t simply the percentage of management company leasing agents who are licensed, but the number of licensed staff affiliated with the firm. At least one major management company has told me that it has dozens of licensed staff and avoids MRED primarily for that reason, and secondarily because of the time involved in listing input and maintenance. That same firm has specifically told me that a) it will cooperate with any licensed agent and b) it cooperates, as you note, very selectively with the rental services. Management company employees are exempt from licensing, as you note, for properties owned by the company or if they are a resident manager of the property. My understanding is that the licensing requirements apply to non-owned properties when a management company leasing agent is not the resident manager of a property. Most of the larger multi-property management firms do not own all of the properties they manage. As to whether the process “forces the agent to work for the landlord like a car salesman,” as you state, I believe a landlord has the legal right to require an agent to represent him as a condition of allowing an agent to bring in a renter. The bedbug / maggots all suggest that they’re representing the tenant, rather than the landlord, and none of them that I’m aware of comply with the agency disclosure requirements of the licensing law. I’d agree that the large-firm agents are largely ignorant of the fact that management companies will do business with them. The large management companies I know have a different relationship with rental services than the fairly cynical one you suggest. It’s a hate / fear relationship in many cases. The management companies hate doing business with the rental services but fear not doing business with them because of a) the volume of tenants they work with and b) the vicious retaliation that some of these services have been known to engage in against firms that shut them out. On the plus side, with the strength of the rental market, some of the large firms are no longer courting rental services as aggressively as they once did, and some have reduced the commissions they’re willing to pay. Hey Joe – I think you could easily change this conversation and focus on some of the shady sales agents at Coldwell Banker. As a very experienced Broker of 15 years, I can say that you are laying it on pretty hard to the rental services, while maybe not giving the attention needed to the sales industry? why don’t we start a blog on your site of shady real estate agents that work at Coldwell Banker? At least then we will feel you are being non-biased and operating on a level playing field. What do you say? I will be happy to start with two of my favorite shady Coldwell Banker brokers. Joe – Do you want to do a quick run through Trulia or Zillow and point out all the Coldwell Banker listings that were sold months ago but yet are still listed as active? How about the reviews of the agents on these sites? Do you think they are real or perhaps posted by the agents themselves? You are quick to point out Craigslist where all the false advertising occurs, but fail to point out that the Coldwell Banker agents are doing the same on these other sites. I’ll engage with a real person – but not with an anonymous coward with a fake email address who makes charges with no specifics. If you’re a real broker, it’s unethical for you to do what you’re doing – and who’s going to believe anyone who’s acting unethically? Put your identity on the line if you want to make allegations against anyone. Failing that, I’ll simply delete your comments. Joe, I find it kind of humorous that you always hide these allegations behind a website. Why not go out and announce them in the public? Hold a conference? Visit these agencies in person and take videos of you calling them out? Are you too scared to confront people face to face? It certainly seems like it…always hiding behind a computer screen and a video camera. I note that this is one of 4 comments you’ve posted under 4 separate screen names with 4 separate phony email addresses – while accusing me of hiding! I’ve deleted several of your wild comments. I’ll go to any rental service sales meeting and educate the group face-to-face about what the law requires, how their company violates it and what the legal consequences might be. Made that offer before and no company has taken me up on it. I’d be happy to make a video of the event. Want to take my up on my offer? Okay Joe, then let the non-professionals post about the scams they see Coldwell Banker agents do. That would be consistent with your rental blog where you tear part many companies. I agree most agree the harsh treatment, but again to show you are truly not biased, why not open it up to the sales side as well? Any comment on the fake listings and fake reviews on Zillow, Trulia, and other similar sites? You know they are all over the web and you know they are placed in just as a misleading way as the Craig’s List stuff you sited. Not trying to start a war with you but do you think you are biased and have an agenda in you blogs. I’ve stated my biases and my agenda repeatedly – unlike you, who hides behind a phony email address with a celebrity’s name in it. The companies we work with are honest and ethical as a matter of policy, unlike the rental services which operate dishonestly as a matter of policy. We’ve refused advertising from and refused to work with companies that routinely deceive the public. Why do I prioritize one over the other? You’d have to be brain dead not to understand that. How can I comment on “the fake listings and fake reviews” when you’ve provided only wild charges with no specifics? If you have a specific problem, report it to the website, the company involved, IDFPR or the Chicago Association of Realtors. The major brokerage companies address problems. Rental services spawn them. Joe – You claim to be posting to watch out for the publics interest. I am simply asking that you do the same research of brokers on the sales side. I am not hiding but certainly don’t want you to jump all over me. I am trying to make a living here. I sure you will be happy to do this if you want to keep credibility with your site. I’ve written many times over the years about problems with brokers on the sales side – problems which are minuscule compared to the scale of problems with rental services. I don’t have a credibility problem. You know that. It’s why you’re trying so lamely to question it. And yes, you are hiding. You listed every apartment finding service in Chicago. I think the management company or the landlord is to blame. There are several small firms that I know reasonably well that are not on the list. And, there are individual agents at the large, traditional brokerage firms that do a very professional job of assisting renters. There’s plenty of blame to go around for the current state of affairs. The landlords, unfortunately, let the situation deteriorate to the point that they now perceive themselves as in a boiling frog situation and don’t see an easy way out of it. I’d say that many landlords are like victims in the midst of a mugging who realize they shouldn’t have taken the shortcut down that dark alley, and are temporarily submitting rather than fighting. As someone looking into relocating to Chicago in the very near future, I’d love to find out more about these small firms that you mentioned – as well as any reputable, professional individual agents. I have no idea where to begin my apartment search because, as you mentioned, Craigslist seems to be full of junk and scams and spam these days. Any expertise or recommendations from your side would be hugely helpful, not just to me but to many people in the same boat! We represent so many competing brokerage firms that we can’t single out any for recommendations. Start with our rental guides, at-a-glance apartment lists and Lincoln Park, Lake View and Gold Coast summaries. You’ll find a ton of links for direct-to-landlord options. 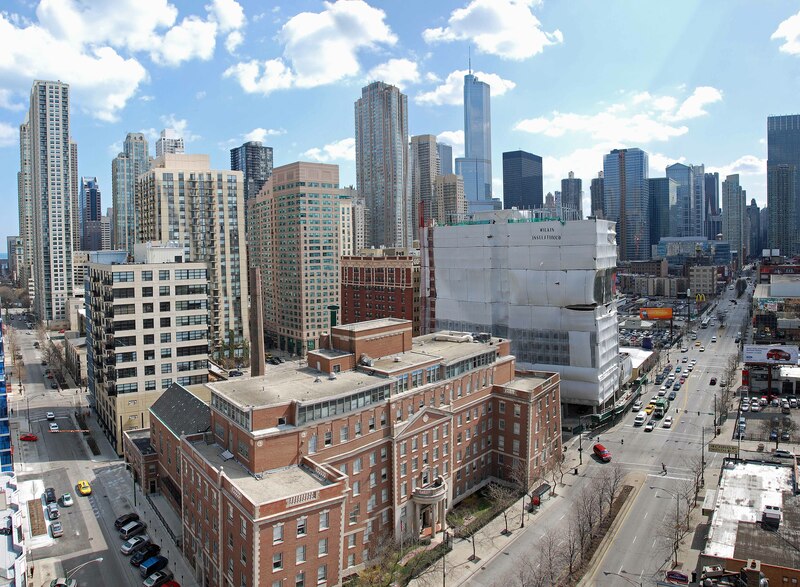 I believe that the best strategy for a Chicago newcomer is to start out in a great neighborhood and take the best apartment they can find there, even though it might not be the ideal apartment or one that’s as nice as they can find in a less-attractive area. You want to experience Chicago when you’re new here, not your apartment. They might help you find an apartment, but if they manage that property, better do research on their negligent building management skills. Poor poor property management. I suggest anyone considering renting a building managed by Chicago Apartment Finders to Google ‘CAF property management’ and decide for yourself. As their names states, they may be good at finding apartments, I don’t know, but as property managers, look elsewhere. They NEVER answer the phone! You can call anytime during business hours, but they will not answer the phone. Their “Director of Property Management” can be found on linkedin, try reaching out to her. After being ignored repeatedly by the property manager for my building, I wasn’t surprised to find myself being ignored by this “Director” level manager. Extremely poor management practices which roll downhill all the way to the individuals servicing your apartment. If you value our home, valuables and family- before signing a lease ask about the building management, if it is Chicago Apartment Finders, run don’t walk the other way. Can’t wait for my lease to be up. If you had supplied a verifiable email address you might have some credibility. Since you haven’t, your comment is worthless and readers are well-advised to discount everything you say. I’ve tried posting on Craigslist and got some real people looking for real apartments. Its sad that there are so many scams on CL. Renters should def. work with a broker in finding a apartment. I am looking for a rental unit and came across Tricap Preferred. An agent has reached back out to me and he seems professional. Upon doing a google search for reviews of the company, I came across your blog here. Realizing that the company is listed on the ‘bedbug’ list…can you provide further examples or why I should potentially avoid Tricap Preferred? First off, I appreciate the sheer amount of work that’s gone into this site—invaluable for someone planning to move here, as I’m planning to. I’ve been following this site for a while now, (while I wait for my house sale, and other assorted domestics here in the UK, to go through); watching rentals come and go, and trying hard to sort out the ‘good guys’ from the ‘bad guys’ for when I am free to take the plunge myself. I got pretty demoralized the first time I went through Yelp reviews for the Management companies list…! I know not all reviews are bad, but you end up suspicious of the good ones too. So, I’ve been mainly following the listings via Coldwell Banker, Koenig & Strey and Prudential Rubloff: looking for something ‘decent’ (read ‘quiet’, as I work from home) in Lincoln Park for around the $1500 mark, but even a Koenig listing can link to property listed by Apartment Guys LLC — an outfit who feature there on your Do Not Call list. Which gets those apprehension levels rising one again. It’s hard, and there’s a lot to take in. I so want to get this first rental right, and not get completely fleeced in the first few days. Koenig & Strey and other broker sites show you all the listings in the MLS – some of which are fraudulently placed by rental services. One simple rule of thumb is to avoid any listing that doesn’t have an address, which is often the case for rental service listings. Check out our Lincoln Park apartment list also – the major management companies should have a lot of offerings in your price range. —I appreciate the reply, and the tip too. Cheers! I have a stepdaughter wrestling with being screwed by American Realty Pros LLC—she and her girlfriend signed a lease for a studio apartment, then were told less than a week later they had to move out because the “building owner would get fined because too many people are in the studio apartment”, citing a maximum of 2 people to a studio apartment had already been reached. Add to this the maintenance man coming to their door at all hours (including 10pm), and the girls just want to leave now. However we are demanding the whole 1st month and move in deposit back–any idea whether or not we should expect this? If not, is there recourse beyond filing a complaint with the Illinois Department of Financial & Professional Regulation? I have an attorney ready to take the case, but expect these jokers are in court often. Ideas? I’d have to have a much better grip on the facts before wading into this. Suggest you work with the attorney you’ve been in contact with.